We love our bucket and bag toilet solution, but it’s not really suitable for longer term use inside the van. We decided to try out a composting toilet instead. First, we had to find a suitable one. Most composting toilets that will fit in a van don’t actually compost your poo. Instead, they could better be described as waterless separating toilets. They don’t flush with water, and they separate the pee and the poo into different containers. Because the pee and poo aren’t mixing together, they don’t start smelling bad. There are some toilets made for use in houses that do turn the poo into compost. They need a big holding tank and electricity. That’s not possible in a van. Instead, for a mobile situation the poo holding tank doesn’t really compost the poo, it just dries it out somewhat. The poo is mixed with either peat moss or coconut coir to help it dry out and break down. It only needs emptying every couple of months for part-time use. A fan and vent pipe keep any odors out of the van and help with the drying process. The pee is collected in a container that you empty every couple of days. If you want to put a composting toilet in your van, there are four main options. Three are commercially available toilets, and the fourth is some variation of a DIY project. This is the option we chose. You can buy it direct from the manufacturer, or via Amazon. We went the Amazon route because the manufacturer’s lead time was too long. When you add in shipping from the manufacturer, the Amazon price is pretty similar with free two-day Prime shipping. You also need coconut coir to go in the toilet. Slightly cheaper than the Air Head. Comes with an option for a “spider” cranking handle for tight spaces. The grey speckled plastic might not be to your taste if you like your toilets to look shiny and white. The seat is moulded into the bowl rather than being a lift-up wooden affair. It still has a lifting lid. The way that the unit hinges means it needs an extra 1-1/2″ space behind it. You have to lift the bowl part of the unit up slightly in order to remove the pee container. That exposes the poo part of the container temporarily. Only an issue if you are in any way squeamish – it’s not like it smells bad. The Air Head toilet is is the other option that people tend to use if they don’t get the Nature’s Head. We preferred this design because you don’t have to lift the main bowl in order to remove the pee container. Unfortunately the stirring handle on the Air Head sticks out too far for where we want to put the toilet, and you have to choose which side you want it on before you order (the Nature’s Head handle can be swapped at any point). Air Head’s toilet lets you remove the pee container without lifting up the top half of the unit. The floor brackets allow you to remove the pee container without lifting the bowl off the base of the unit. Real wooden seat (if you care about that type of thing). No space needed behind the rear of the unit. Even more spendy than the Nature’s Head. Air Head recommends using paper bowl liners when you poop. These look like oversized coffee filters. Adding pee-soaked paper to the poo holding tank doesn’t sound like a great idea to us. Some users just open the hatch before pooping, same as with the Nature’s Head. This option is really appealing because it’s cheaper than the other two toilets. But it’s still $500 for a toilet. Check out the site to get a feel for this unit. The construction of the poo storage container and diverter funnel looks sturdy enough, but it’s got a home-made feel to it. C-Head toilet. This one uses gallon milk jugs to hold the pee. Half the price of the other commercial options. Uses easily-obtainable 1 gallon milk jugs for the pee container. Stirring handle is on the top, not the side, so less room needed either side of the unit. The pee container is only 1 gallon. That means you’ll probably be changing it daily. Looks slightly more home-made on the inside. Has a hole in the back of the seat for a separate stirring handle to slot in. If you build it yourself, your choices range from a 5-gallon bucket and a stirring stick up to buying a moulded toilet basin with a built-in diverter such as the Separett 501 and attaching your own seat and base to it. Sun-Mar and Separett are two other composting toilet brands, and they’ve both been around for a while. However none of their models are suitable for van life. Sun-Mar do make one “mobile” toilet for around $1800. It’s massive and needs a 110v power supply because it evaporates the pee inside it. Separett make a “weekender 7000” model for $900 which is compact but it still needs a urine collection tank outside the unit itself. That’s OK if you’re retro-fitting an RV that has a black tank, but it’s not the self-contained unit we were looking for. Buying a composting toilet without ever having used/smelled one before is a big gamble because of the high price. None of the commercial options feel like they are worth the money being charged for them. Obviously the manufacturers have to recoup their R&D expenses, and they probably aren’t selling these toilets in high volume, but one thousand dollars for a rotationally molded plastic toilet seems excessive. 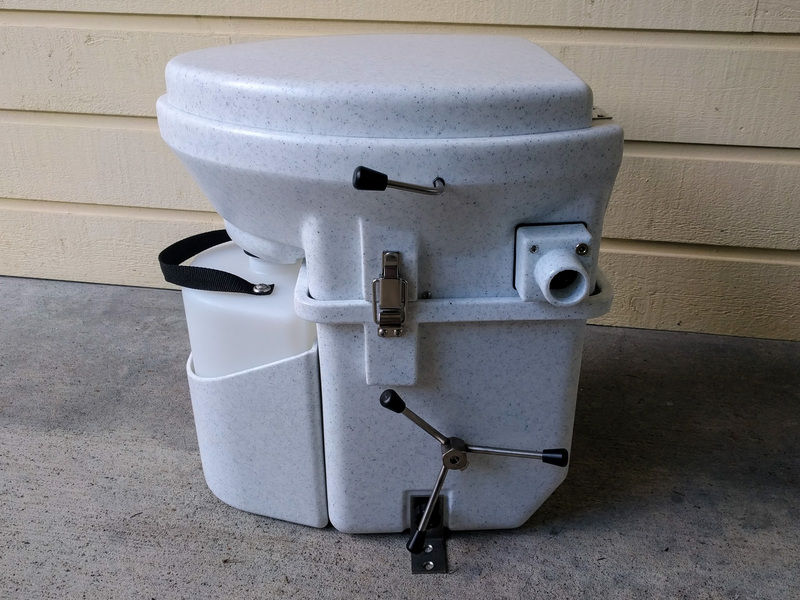 You can buy a regular Thetford Curve Porta-Potti for just over $100. You can get a cassette toilet in the $400-$800 range. Obviously companies making this type of toilet sell a lot more units, so they have the benefit of volume sales to help keep their prices down. The composting toilets just seem expensive in comparison. The cassette style toilets seem like a smart idea, but we’d need to empty the cassette too frequently. We’re often gone for a week or more and it would be hassle to find and drive to a dump station or regular toilet during that time. The composting toilets are waterless. That means less water to carry, and less weight in black/grey water. So long as the pee and poo don’t mix, there shouldn’t be any nasty fermented waste smells, unlike in the holding tank style toilets. We wanted to be sure about this purchase, so we did some reading on the Sprinter Forum and watched some YouTube videos. A good general “What type of toilet?” thread on the Sprinter forum. Gone with the Wynns explain what a composting toilet is in this video. Next we plan on setting our toilet up in the guest bathroom and testing it out for a week or so. Then, if all goes well, we’ll mount it in the van for an upcoming trip and see how it performs! Good info, you made your homework! We installed our Nature’s Head in our Transit a few weeks ago, we’re very pleased with it! It’s SO convenient having a toilet in the van. It’s still too soon to tell if the toilet is actually composting or just drying out the manure, time will tell. And it’s true: there is no odors in the van, nice! Thanks Antoine, it’s good to know there’s no smell! We’re installing ours this weekend. Dan, thanks for that. That’s pretty much what we were doing with our bucket and bag solution right now. It definitely works OK, but we’ve found that it’s hassle when you’re using the toilet full time for a week or so. That’s why we opted for the “composting” version. After putting a Nature’s Head in our RV I can’t imagine ever going back to a black tank or a bucket system. Previous PostPrevious When will Mercedes start building Sprinters in the USA?